Model AccuPoint TR22-1 Trijicon is intended to hunt big game. 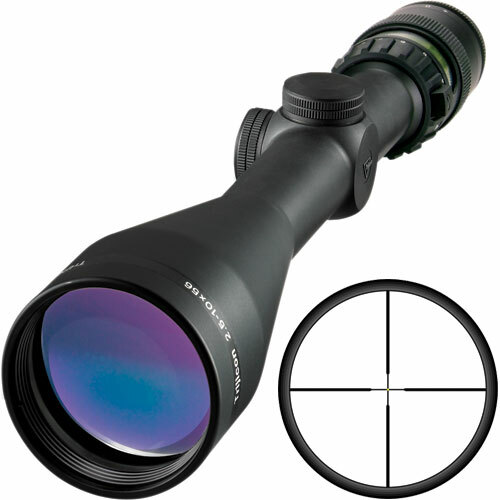 It is designed to ensure accurate and efficient shot, even in extremely difficult conditions and in long hunting. Thanks to a unique tritium technology, amber lights, representing the point in the middle of Cross vane type Mil-dot, ensuring accurate targeting and optimal image clarity, no matter the degree of external illumination. AccuPoint new series are equipped with an option for manual settings of the light mode, which allows for dimming of fiberglass during the day and decrease the brightness of the viewfinder with increasing intensity of external light. All Trijicon optics are equipped with modern optical elements, one of which are coated with multi-coated lenses for better passage of light without scattering. This option ensures exceptionally clear image and precision shots. In addition, opportunities for fast focusing and to maintain a greater distance between eye and eyepiece. Options for horizontal and vertical adjustments allow for quick adaptation to changing environment. The body of any optical instrument is made of aluminum alloy 6061-T6 marks and is filled with nitrogen, which prevents fogging of the glass, and protection from oxidation and rust, and to enhance the resilience of the upper layer of the hull, it is subjected a special heat treatment. Black matte finish, in turn, limits to minimize glare and protects the shooter from disclosing its location.